First, get that jar of coins that's been sitting there gathering dust and change for years. Empty it out and help your nieces and nephews sort the coins. Then, have them count how much money it adds up to. You'd be surprised how quickly the change adds up! Kids will learn math and value of each coin while they get excited about how much money is adding up! Depending on the age of the child, use the coins to play math games. For example, say: If I need $1.38 to buy some apples, help me sort coins to add up to $1.38. "Then, reverse the problem. Tell the children they are the cashier and the apples are $1.38. Pay them $1.80 in coins and have them give you back the correct change. Finally, tell them that each apple is $0.23 and ask how much they think it will cost to buy six apples. Then have them add up the exact change. If you are playing with more than one niece or nephew, make it a race to the finish! And the reward for all their fun work? They get to decide how to spend some (or all!) of the coins! Take the coins to a coin machine or bank where they have change machines. The kids will love dumping all the coins into the machine and hearing it sort them, like a mini-Las Vegas casino! Once you have converted your change into dollars, split the money between your nieces and nephews. Depending on how much money you ended up with, you can take them to a dollar store or a larger retailer and let them choose a gift each with their share. This experience will teach them about the value of money. Or, suggest they use their coin "earnings" to take Auntie out for lunch or ice cream for a change! (Get it? Change!) They will have to stay within budget so it will be another opportunity for a math lesson. Finally, set aside a percentage of the funds to give to charity. 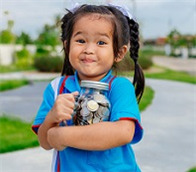 If the children have a fundraiser at school, consider that option as it may add an additional sense of pride for the children. As a craft project, have the kids decorate their own coin jars! Use mason jars or clear plastic containers and let them paint them with clever designs. Now, they can start collecting their own change. This will help teach them about the value and reward of savings at a young age. This is what we call making a niece and nephew experience count! Home Activities Make it Count!